Aerospace Engineering students Gino Perrotta (left) and Brooks Muller (right). 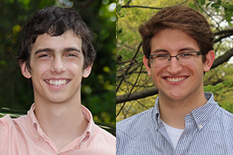 Department of Aerospace Engineering students Gino Perrotta and Brooks Muller placed at the American Institute of Aeronautics and Astronautics (AIAA) Region 1 Student Paper Conference held in Ithaca, N.Y. April 25-26. Over 70 papers were presented during the two-day conference, and almost half of the papers presented were by University of Maryland students. Muller’s paper, "Development of 135 gram Cyclocopter at Micro Air Vehicle Scale," placed third in the undergraduate paper division. His research described the design, development and testing of a cycloidal-rotor aircraft (Cyclocopter) at micro air vehicle (MAV) scale. The cycloidal rotors used on this vehicle have a horizontal axis of rotation in which blades span parallel to the axis of rotation and perpendicular to direction of flight. This cyclocopter is designed with two such rotor assemblies and a horizontal tail rotor. The combination of independent RPM control of all three motors, thrust vectoring of the cycloidal rotors and an effective control strategy provide the vehicle with decoupled roll, pitch, and yaw, making the cyclocopter a highly adaptable and maneuverable MAV. Muller’s research also described how their 135 gram cyclocopter was able to achieve a stable hover through the implementation of a feedback controls system using an onboard processor-sensor board equipped with an accelerometer, gyros, a microprocessor, and wireless communication capabilities. Muller, a senior in Aerospace Engineering, is a member of the AIAA professional society and the Sigma Gamma Tau National Honors Society in Aerospace Engineering. Muller's areas of interests include space systems and propulsion technology. Over the last year, Brooks has been working with Dr. Moble Benedict and Dr. Inderjit Chopra in the Alfred Gessow Rotorcraft Center to design and build a lightweight cyclocopter. Perrotta’s paper, "Characterization of Rotor Wake in Ground Effect," won first place in the graduate paper division and described the measuring of helicopter wake in ground effect using particle imaging velocimetry for a small scale rotor. Unsteady flow features carry the majority of the wake's kinetic energy, so he developed a method for quantifying the unsteady features of the wake. Vortex identification, tracking and characterization are used to describe the rotor tip vortices in terms of three scalar quantities. Trends in these three vortex characteristics, with respect to rotor rotational speed, were discussed and validated, and additionally, the wake turbulence was characterized. This research contributes to the study of rotorcraft brownout—in-flight visibility restrictions created by dust or sand blown into the air by an aircraft. Perrotta is a recently qualified Ph.D. candidate in aerospace engineering. He received his B.S. in aerospace engineering in 2012, and he is currently completing his M.S. Perrotta works in the Jones Low Reynolds Number Aerodynamics Lab researching helicopter brownout, and he has also completed research in wind turbine aerodynamics. Before graduate school, Perrotta worked at U.S. Air Force Hypersonic Wind Tunnel 9 developing temperature sensitive paint and at the Smithsonian National Air and Space Museum.